PhD student, Michelle L. M. Collins, working with Scott Chapman (IoA, Cambridge) and members of the Pan-Andromeda Archaeological Survey (PAndAS) (including me), has had her paper on the study of the size of dwarf galaxies accepted for publication in MNRAS. This paper shows further evidence that the dwarf galaxies around the Milky Way are different from those around its sister, the Andromeda Galaxy, and suggests that there must have been some difference in the way these two similar galaxies formed and evolved. Well done Michelle!!! The lead on the paper is Dan Mortlock. I've known Dan for years; he was a PhD student at Melbourne when I visited in in 1995 (I was finishing up my thesis at the time). Excellent result. PhD student, Anjali Varghese, working with me and my close colleague, Rodrigo Ibata, has had her paper working on probing dark matter halos with stellar streams accepted. Congratulations Anjali!! Oh no!! There was a zombie outbreak in Leicester and it was clear that the city council was completely unprepared. Maybe they had not mathematically modeled the outbreak!! Let's take the next step in the modeling and add a fight back factor. This means that there is a chance that, during a Healthy-Zombie interactions, the Zombies themselves can be truly killed and moved into the Dead population. where we now have a new parameter, δ, which controls the probability of killing Zombies. This is quite interesting. Clearly, the timescale for things to happen has been extended; it now takes a couple of weeks until the Zombies take over, but the population of Healthy humans still crashes very quickly. It's been a very productive week, and so I am going to take a little time to write up some Zombie Apocalypse code. As I noted previously, this is based on a earlier piece of work, but I am going to extend the model (and modify it to more accurately match zombies in movies). The start point is the variables we will be following. These are H, the health humans, I, those bitten by a zombie and so on their way to zombiedom, Z, the star of the show, and D, the well and truly, non-zombie, dead. Unlike the previous work by Robert Smith?, I don't assume hat any olf dead are revived. Rather, those that are bitten become infected, die and become zombies. Other dead remain dead, and as we know, a knock to the head moves a zombie into the permanently dead camp. Another article of mine has been published on The Conversation. Titled God, the Big Bang … next please …, I discuss whether the Big Bang was the birth of the Universe. The reason for writing this is the catch call from those wanting to undermine modern cosmology, declaring its birth from nothing is illogical. While we have no theory of everything, with no single picture encompassing gravity and the other forces (and be careful of what you hear from the hype known as superstrings), we cannot see "through" the Big Bang, and don't know what was before it. But that does not mean we think there was nothing, literally nothing, no time and no space, before the Big Bang, and plenty of ideas are out there on what possible came before. We could be a daughter universe, born during the formation of a black hole in a universe before, or just one of a continuation of cycling universes, or something even weirder we haven't even thought of yet. "Hubble observation time is internationally sought after and very competitive," says Professor Lewis who is known for his work on galactic clusters. Professor Lewis' project is targeting old stellar systems, known as globular clusters and is part of a large international team, led by Dougal Mackey at ANU, and includes astronomers based in North America, the UK and Europe. "These clusters are orbiting our nearest cosmic neighbour, the Andromeda Galaxy at very large distance. While Andromeda seems to have a number of these, our own galaxy, the Milky Way, does not. We really want to know why there is this difference." The Hubble Law; or is it? One of the greatest discoveries of the 20th Century was the discovery of expanding Universe. Of course, what this means is that see the light from galaxies redshifted, with more distant galaxies having a larger redshift. Importantly, this is precisely what you expect from a Universe described by general relativity, in terms of the expanding space-time metric given by the Friedmann-Robertson-Walker metric, and governed by the Friedmann equations. Converting a galaxies redshift into a velocity (by treating it as a Doppler shift), Hubble's law is v = Ho d, where v is the velocity, d is the distance, and Ho is the (in)famous Hubble constant. It is Ho that tells us how fast the Universe is expanding at the moment. A couple of years ago, Robert Smith? 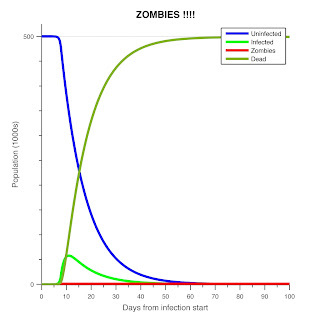 and collaborators published a paper on numerical modeling a zombie outbreak. The article got lots of press mileage, but I think that an important message did not shine through. While I am sure that the authors are not getting ready for the coming zombie apocalypse (although others clearly are), the story is about how more realistic hazards, such as diseases, can be computationally modeled as they flow through a population, and this, as we all know, is governed by differential equations. Why computational? Because (and this is not a fact we really make apparently to our undergraduate students) the vast majority of differential equations do not have analytic solutions, and we need to turn to the computer to model complex interactions. And if I had the opportunity to study zombie outbreaks as an undergraduate, I am sure that learning about differential equations and computational approaches would have been a lot more fun. I mean how the heck did ‘dark energy’ ever become shorthand for ‘the universe is expanding with a uniform acceleration’? I have to agree. It seems that, with the recent Missing Mass Hysteria, there are some issues to do with astronomical press releases, namely that the truth is somewhat stretched to make the story interesting to the media. This is, in my opinion, a problem. Some feedback I have received on this is that any press is good press. But I don't think this is necessarily the case. What happens when dark energy is possibly shown not to be real? Or that the missing mass was not discovered by an undergraduate student during a vacation project? Should we even have a "Cosmology" prize? As part of the discussion on the Gruber Prize being held over at Peter Coles's blog, the question whether a prize in one small part of astrophysics, namely cosmology, is a good idea? Not that I have checked in detail, but I doubt there are similar prizes in symbiotic stars, dwarf galaxies, intra-cluster gas etc. So why cosmology? A quick squizz at wikipedia you can see that the Gruber Prize in cosmology is one of five international prizes awarded by the Peter and Patricia Gruber Foundation, the others being in Women's Rights, Genetics, Neuroscience and Justice, as well as another prize for Young Scientists. These are all worthy prize areas, and my feeling is that this is effectively private money and they can give it to whom ever they want. The 2011 Gruber Prize for Cosmology has been awarded to the "Gang of Four", Marc Davis, George Efstahiou, Carlos Frenk and Simon White. The award is for their work on “their pioneering use of numerical simulations to model and interpret the large-scale distribution of matter in the Universe”. 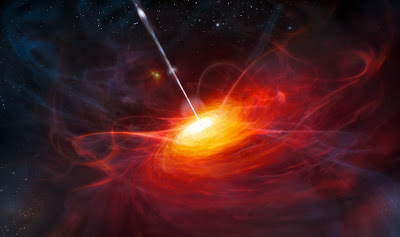 And just to round off this first day of posting, here's a link to my other article in The Conversation, namely "Adventures in the dark side of cosmology". This was in response to a press-release titled "Dark Energy is Real" which recently came out of the "WiggleZ", and is a bit of a comment on what "real" means in cosmology. By the way, WiggleZ is not pronounced "Wiggle-Zee", or "Wiggle-Zed", but after an Australian Cultural Icon. Will we ever see the Big Bang? As an opening post to this blog, I have very recently published an article in The Conversation entitled "Will we ever see the Big Bang?"